A warrior Ostrogoth has just killed a Roman enemy on the Battle of the Catalaunian Fields. Behind you can see an archer Hun. In this battle the Ostrogoths (Eastern branch of the Cup tribe, from Ost goten, Goths of the East), who were a faithful contingent of Attila’s army. They came face to face their Visigoth cousins (from West Goten, Goths of the West), allied with the Romans. As far back as the 370s when they were attacking Goths beyond the Black Sea, Huns were forcing others they had already subdued to fight alongside them. 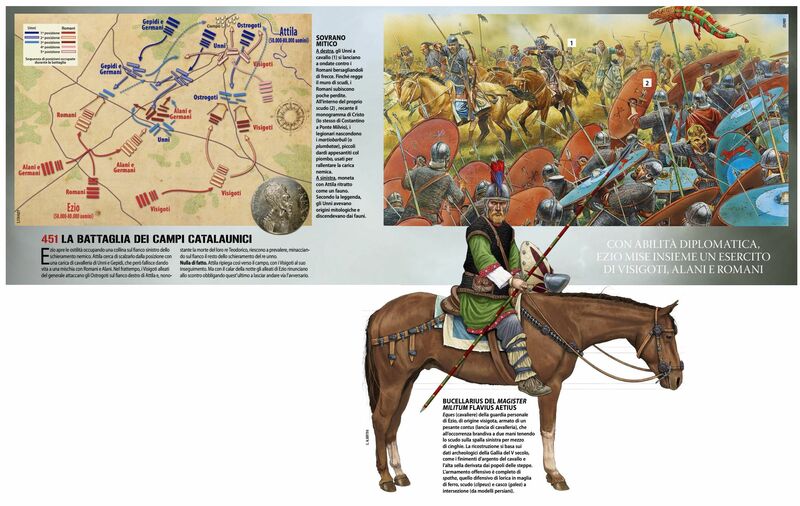 When they first attacked the Greuthungi, starting the avalanche that ended at the battle of Hadrianople, they were operating in alliance with Iranian-speaking Alan nomads. And whenever we encounter them subsequently, we find that Hunnic forces always fought alongside non-Hunnic allies. Although Uldin, was not a conqueror on the scale of Attila, once the east Romans had dismantled his following, most of the force they were left with to resettle turned out to be Germanic-speaking Sciri. Likewise, in the early 420s, east Roman forces intervening to curb Hunnic power west of the Carpathian Mountains found themselves left with a large number of Germanic Goths. In the years preceding the rise of Attila, the process of incorporation continued apace. By the 440s, an unprecedented number of Germanic groups found themselves within the orbit defined by the formidable power of Attila the Hun. For example, his Empire contained at least three separate clusters of Goths. One group, dominated by the Amal family and their rivals, would later become central to the creation of a second Gothic supergroup: the Ostrogoths. Another Gothic group was led in the mid-460s by a man called Bigelis, while a third remained under the tight control of Attila’s sons until the later 460s. In addition, Germanic-speaking Gepids, Rugi, Suevi (left behind in 406), Sciri and Heruli were all by this point under direct Hunnic control, and a looser hegemony may also have been exercised over Lombards and Thuringians, as well as over at least some subgroups of the Alamanni and Franks. We can’t put figures on this vast body of Germanic-speaking humanity, but the Amal-led Goths alone could muster ten thousand-plus fighting men, and hence had maybe a total population of fifty thousand. And there is no reason to suppose that the other groups were much, if at all, smaller. Many tens of thousands, therefore, and probably several hundreds of thousands, of Germanic-speakers were caught up in the Hunnic Empire by the time of Attila. In fact, by the 440s there were probably many more Germanic-speakers than Huns, which explains why ‘Gothic’ should have become the Empire’s lingua franca. Nor do these Germani exhaust the list of Attila’s non-Hunnic subjects. Iranian-speaking Alanic and Sarmatian groups, had long been in alliance with the Huns, and Attila continued to grasp at opportunities to acquire new allies. Every time a new barbarian group was added to Attila’s Empire, that group’s manpower was mobilized for Hunnic campaigns. Hence the Huns’ military machine increased, and increased very quickly, by incorporating ever larger numbers of the Germani of central and eastern Europe. In the short term, this benefited the embattled Roman west. The reason, as many historians have remarked, that the rush of Germanic immigration into the Roman Empire ceased after the crisis of 405–8 was that those who had not crossed the frontier by about 410 found themselves incorporated instead into the Empire of the Huns; and there is an inverse relationship between the pace of migration into the Roman Empire and the rise of Hunnic power. In the longer term, however, the respite from assault was only illusory, and a succession of Hunnic leaders achieved something analogous to what the Sasanians had achieved in the Near East. For the first time in imperial Roman history, the Huns managed to unite a large number of Rome’s European neighbours into something approaching a rival imperial superpower. The full ferocity of this extraordinary new war machine was felt in the first instance by the east Roman Empire, whose Balkan communities suffered heavily in 441/2 and again in 447. 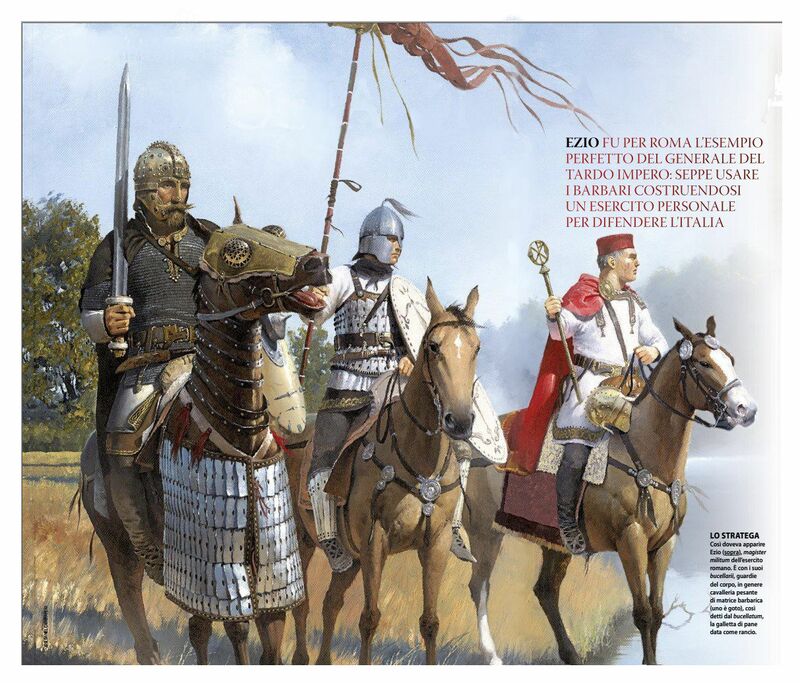 After the two defeats of the 447 campaign, the east Romans had nothing left to throw in Attila’s direction. Hence, in 449, their resorting to the assassination attempt in which Maximinus and Priscus found themselves unwittingly embroiled. Still Attila didn’t let Constantinople off the hook. Having refused to settle the matter of the fugitives and repeated his demands for the establishment of a cordon sanitaire inside the Danube frontier, he now added another: that the east Romans should provide a nobly born wife (with an appropriate dowry) for his Roman-born secretary. These demands, if unsatisfied, were possible pretexts for war, and his constant agitating shows that Attila was still actively considering another major assault on the Balkans. Attila swore that he would keep the peace on the same terms, that he would withdraw from the Roman territory bordering the Danube and that he would cease to press the matter of the fugitives . . . providing the Romans did not again receive other fugitives who fled from him. He also freed Vigilas . . . [and] a large number of prisoners without ransom, gratifying Anatolius and Nomus . . . [who were] given gifts of horses and skins of wild animals. Rarely can an international summit have had such a satisfactory outcome. Back to Constantinople rode the jubilant ambassadors, bringing with them Attila’s secretary, who was to be found a suitable wife. What quickly emerged, however, was that Attila had settled with Constantinople not because – as the stereotypical barbarian – he had been blown away by the wisdom of his east Roman interlocutors, but because he wanted a secure eastern front, having decided on a massive invasion of the Roman west. [Attila’s] great good fortune and the power which it had given him had made him so arrogant that he would not entertain just proposals unless he thought that they were to his advantage. No previous ruler of Scythia . . . had ever achieved so much in so short a time. He ruled the islands of the Ocean [the Atlantic, or west] and, in addition to the whole of Scythia, forced the Romans to pay tribute . . . and, in order to increase his empire further, he now wanted to attack the Persians. Someone then asked how Attila proposed to get to Persia from central Europe, to which the reply was that the Huns remembered that, if you followed the north Black Sea coast all the way to the end, you could get there without having to cross Roman territory. True, of course, but going via the Caucasus would be an extremely long trek, and the last time the Huns had done this – in 395/6, as far as we know – they had been living north of the Black Sea, not on the Great Hungarian Plain so much further west. Ambitious plans of conquest, on the face of it, were being drawn up on the strength of half-remembered geography: here was pure lust for conquest aching to swallow up the known world. But, as we know, Attila went west instead. The sources transmit a variety of reasons why he did so. According to one juicy piece of court gossip, he led his armies into the western Roman Empire because the sister of the western emperor Valentinian III, a high-spirited lady of considerable stamina by the name of Iusta Grata Honoria, offered him her hand in marriage with half the western Empire as her dowry. Supposedly, she sent him a brooch with her portrait on it, along with a letter, and this was enough to ensnare him. Honoria was the daughter of the formidable Galla Placidia who had a fondness for barbarians herself, having married and borne a son to Alaric’s brother-in-law Athaulf in the 410s. Placidia, with her Gothic bodyguard, had had what it took to play a major political role, until Aetius took over. Having fallen pregnant, her daughter Honoria was caught in an illicit love affair with her business manager, a certain Eugenius. Eugenius was executed, and Honoria removed from public life and betrothed to a dull senator by the name of Herculianus. It was in her distress and frustration that she had written to the lord of the Huns and asked him to rescue her. But the story gives one pause. Even after it was discovered that she had written to Attila she escaped death, and was handed over to the custody of her mother; but before, irritatingly, breaking off in mid-sentence, the pertinent Priscus fragment hints that further escapades followed. Honoria’s antics are too well documented for there not to be some grain of truth in them, but I don’t believe that she was the reason why Attila eventually preferred the west Roman to the Persian option. Just consider the geography. As we will see in a moment, having decided to attack the west, Attila did not rush towards Italy, where Honoria was incarcerated, but first attacked Gaul. While no doubt sketchy, Attila’s knowledge of European geography was good enough for us to be sure he knew on which side of the Alps he was likely to find his putative bride. We don’t know what ultimately happened to Honoria. Heading west out of Hungary, the Huns turned right towards Gaul rather than left into Italy, and that’s enough in itself to relegate Honoria to a historical footnote. The sources indicate that rescuing Honoria was only one of several reasons proposed for Attila’s invasion of the west. Another was the issue that had prompted his tantrum before the conversation in the summer of 449 in which his possible ambitions concerning Persia had been raised. That particular western embassy had been sent to answer the charge that a Roman banker by the name of Silvanus was in possession of some gold plate that was Attila’s by right of conquest. Trivial though the matter was, Attila was threatening war if it was not settled to his satisfaction. There are also vague, but quite convincing, hints of some kind of contact at this date between Attila and Geiseric, king of the Vandals, who is said to have bribed Attila to turn his armies westwards. Late in 450, Attila backed a different candidate for the recently vacant kingship of the Ripuarian Franks from the one Aetius had chosen to support. He had also recently given sanctuary to one of the leaders of a rebellion in north-west Gaul defeated by Aetius in 448. This suggests that Attila had in mind the possibility of using him to stir up trouble and to smooth the path of any Hunnic army operating in the west. Once his armies were on the move, in much the same vein the Hun sent out some mutually contradictory letters to different recipients, some of which claimed that the purpose of his campaign was to attack not the western Empire but the Visigoths of south-west Gaul, while others urged those same Visigoths to join him in attacking the Empire. What emerges, therefore, is that Attila was simultaneously juggling with several possible pretexts for an attack on the western Empire in the years 449 and 450, as he prepared his next move. Whether an attack on Persia was ever seriously contemplated I doubt, but in 449 he still hadn’t decided whether to launch his next assault upon the eastern or the western half of the Empire; and he was not only stirring up trouble with the west, but also refusing to settle outstanding issues with Constantinople. The generous treaty he eventually granted Constantinople was the sign that he was ready to tie up loose ends in the east, having set his sights on the west. Suddenly the barbarian world, rent by a mighty upheaval, poured the whole north into Gaul. After the warlike Rugian comes the fierce Gepid, with the Gelonian close by; the Burgundian urges on the Scirian; forward rush the Hun, the Bellonotian, the Neurian, the Bastarnian, the Thuringian, the Bructeran, and the Frank. Sidonius was writing metred poetry, and required names of the right length and stress to make it work. What he gives us here is an interesting mixture of ancient groups who had nothing to do with the Hunnic Empire (Gelonian, Bellonotian, Neurian, Bastarnian, Brauteran) and real subjects of Attila (Rugian, Gepid, Burgundian, Scirian, Thuringian and Frank), not to mention, of course, the Huns themselves. But, in essence, Sidonius was spot on. And we know from other sources that large numbers of Goths were also present. No surviving source describes the campaign in detail, but we know roughly what happened. Having followed the Upper Danube northwestwards out of the Great Hungarian Plain, the horde crossed the Rhine in the region of Coblenz and continued west. According to some admittedly fairly dubious sources, the city of Metz fell on 7 April, shortly followed by the old imperial capital of Trier. The army then thrust into the heart of Roman Gaul. By June, it was outside the city of Orleans, where a considerable force of Alans in Roman service had their headquarters. The city was placed under heavy siege; there are hints that Attila was hoping to lure Sangibanus, king of some of the Alans based in the city, over to his side. At the same time, according to another pretty dubious source, elements of the army had also reached the gates of Paris, where they were driven back by the miraculous intervention of the city’s patron Saint Genevieve. It looks as if the Hunnic army was swarming far and wide over Roman Gaul, looting and ransacking as it went. Ezio is an Italian masculine name, originating from the Latin name Aetius. Aetius was still generalissimo of the west, and as we know from Merobaudes’ second panegyric, he had been anticipating the possibility of a Hunnic assault on the west from at least 443. When it finally materialized, nearly a decade later, he sprang into action. Faced with this enormous threat, he strove to put together a coalition of forces that would stand some chance of success. Early summer 451 saw him advancing north through Gaul with contingents of the Roman armies of Italy and Gaul, plus forces from many allied groups, such as the Burgundians and the Aquitainian Visigoths under their king Theoderic. On 14 June, the approach of this motley force compelled Attila’s withdrawal from Orleans. Later in the same month, Aetius’ men caught up with the retreating horde somewhere in the vicinity of Troyes, another 150 kilometres or so to the east. The battlefield was a plain rising by a sharp slope to a ridge, which both armies sought to gain . . . The Huns with their forces seized the right side, the Romans, the Visigoths and their allies the left . . . The battleline of the Huns was so arranged that Attila and his bravest followers were in the centre . . . The innumerable peoples of diverse tribes, which he had subjected to his sway, formed the wings. The fight grew fierce, confused, monstrous, unrelenting – a fight whose like no ancient time has ever recorded . . . A brook flowing between low banks . . . was swollen by a strange stream and turned into a torrent by the flow of blood. Those whose wounds drove them to slake their parching thirst drank water mingled with gore. Theoderic was killed in the fighting, either struck by a spear or trampled to death when he fell from his horse, but the accounts of his death are confusing. Again according to our main source, a total of 165,000 men died, but this figure is nonsense. At the end of the day’s fighting, Attila was distraught. Forced back inside a defensive wagon circle, for the first time ever his army had suffered a major defeat. His initial reaction was to heap up saddles to make his own funeral pyre. But his lieutenants persuaded him that the battle was only a tactical check, and he relented. A stalemate followed, with the two armies facing each other, until the Huns began slowly to retreat. Aetius didn’t press them too hard, and disbanded his coalition of forces as quickly as possible – a task made much easier by the fact that the Visigoths were keen to return to Toulouse to sort out the succession to their dead king. 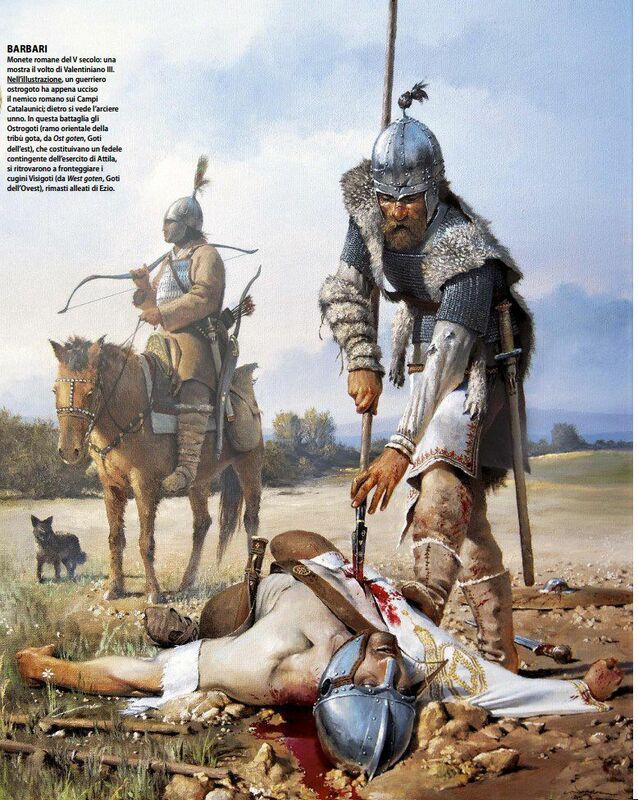 Attila consented to his army’s continued withdrawal and, tails between their legs, the Huns returned to Hungary. Although the cost to the Roman communities in the Huns’ line of march was enormous, Attila’s first assault on the west had been repulsed. Yet again, Aetius had delivered at the moment of crisis. Despite the limited resources available, he had put together a coalition that had saved Gaul.